6 mars, 2014 Säg något! Aaatchoooo! Goddamn it. Sneezing, nose is running and both body and head aches. I’ve caught a cold and I hate it. I tried working Tuesday but had to go home after half that day, my cold just got worse and worse. So I slept for the rest of the day and that’s just about what I have the strength to. I’m just going to post this really quick and then I am going back to bed. I’ve also gotten two new games actually, one that I’ve ordered and one that I won. One is Castlevania: Lords of Shadows 2 and it nice so far. I haven’t been playing much since I’m not feeling well. But yes, I’ve tried it a bit. 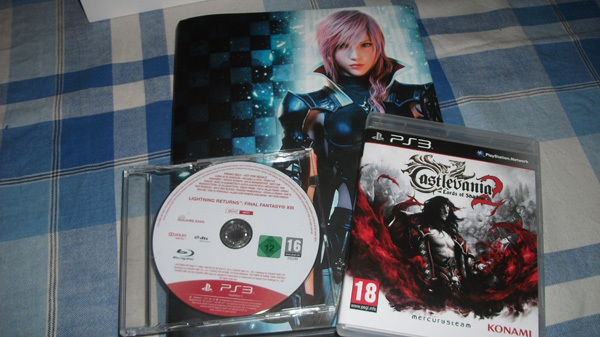 The other I win from PlayerSelect.se and its Lightning Returns Final Fantasy XIII and it came with a guide. A shame it didn’t have a real box and cover instead, I didn’t care much for guides. But I’m still happy I won, the demo for LRFFXIII was fun and hopefully I can enjoy this. Later this month three more games will land in my home, they are Infamous Second Son, Metal Gear Solid V: Ground Zeroes and Final Fantasy X & X-2 HD. So I’ll have my hands full in the future and I am thinking about doing some other videogame related stuff, but I’m not sure what yet. I haven’t got many ideas, but I feel like I want to do something. The only thing holding me back is time, I couldn’t do much more with PSSverige because of time. But I loved doing reviews and I hope I get to do that again in the future, that would be great. So keeping my fingers crossed for either a new project or something else. We’ll see, I have to think more about my own stuff. My throat hurts, I’m cold! Get me a blanket!